Posh Pets Rescue is dedicated to the rescue, rehabilitation, and placement of homeless animals, many of whom are rescued at the very last moment from euthanasia at the city shelters. Posh Pets Rescue provide safe haven to all those who find their way to us through whatever circumstance, whether abandoned, injured, or neglected. No matter the breed, health or age, Posh Pets Rescue believes that all should live secure, healthy lives and they work tirelessly in their attempts to find the right homes with people who will love their pets for a lifetime. Posh Pets Rescue does not have a shelter, but relies solely on a network of foster homes. They receive no public funding and count on the generosity of fellow animal lovers to help defray our costs, which include vet bills and other medical expenses for the many animals who come to them sick or in need of special care, as well as food, supplies and other items needed for the safety and comfort of our rescues. They did not have a website and needed a web presence to help find homes for their dogs, spread the word about their organization, and inspire people to donate time, money, or assistance. 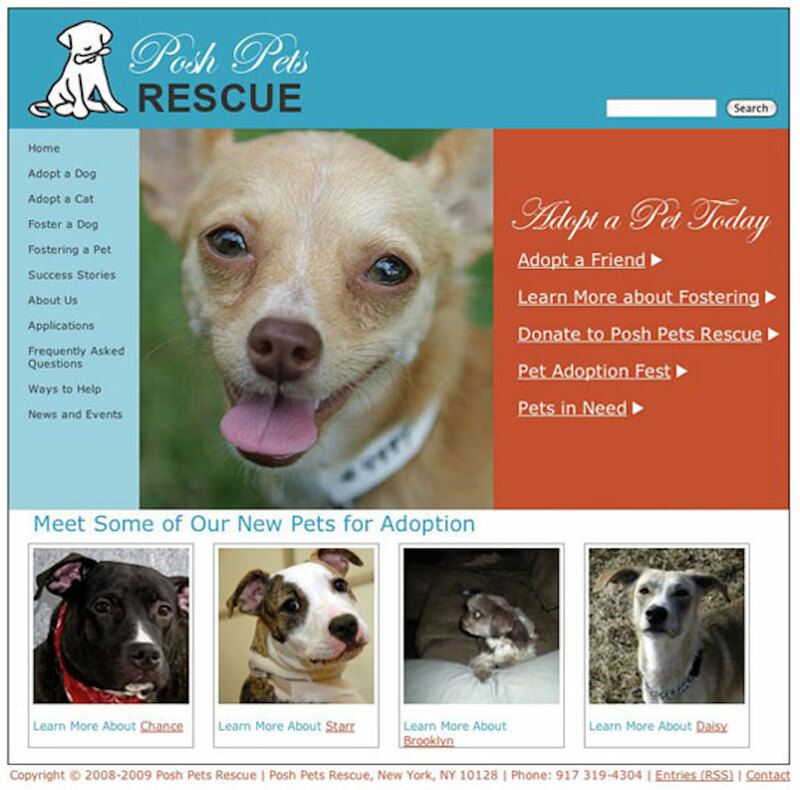 I built PoshPetsRescue.org in 2008 with the design help of Karen Bonna, The new website has not only enabled Linda the ability to better market the pets she works so hard to save, it helps her post the content and get back to what she does best – saving lives.